This is one of the earliest still life paintings known from Spanish America. The three cabinet shelves have been filled with musical instruments, toys, food and table ware. As was typical of the genre, this painting displays not just a random assortment of objects, it would also have been read as an allegory. On the top shelf, it is not child’s toy, but a statuette of the Infant Christ in need of repair. The hole on the head would have once held a silver halo. The palette and paintbrushes behind the basket that holds the infant Christ suggests these are shelves in the workshop of an artisan. On the second shelf, the wooden boxes at left held cajeta, a caramel made of goat’s milk. Behind the boxes are dishes made of silver, mined in New Spain, whereas imported blue-and-white porcelain, is on the bottom shelf. Adjacent is a copper pot to hold chocolate, a favored beverage in New Spain, drunk from the painted gourd bowl at top. On the left edge, the cabinet keys have been painted in trompe l’oeil to suggest one could simply reach out and unlock the cabinet. Little is known of the artist, Antonio Pérez de Aguilar. He may have been familiar with Spanish bodegón paintings of the Baroque period, of similar subject matter. The work is oil on canvas, and measures ca. 49 x 38.5 inches (ca. 125 x 98 cm). Its artist, Antonio Pérez de Aguilar, employed a technique called trompe l’oeil, or “trick of the eye.” By painting three-dimensional objects at life size in a very shallow space, he was attempting to trick the viewer into believing, at least momentarily, that the painting displayed things of the actual world. The painting was given to the Academy of San Carlos in the 1780s, a mark of how highly it was regarded. It remains in Mexico’s national collection. This painting can be seen as both quotidian and highly symbolic. The shelves are stacked with objects from every day life—glasses, imported plates, storage vessels, containers for food, books. The presence, among these objects of daily life, of objects related to Christian worship (the bread and wine of the Eucharist, the figure of the Infant Jesus) suggests how residents of New Spain saw these worlds as inseparable. Gutiérrez Haces, Juana. 1990. 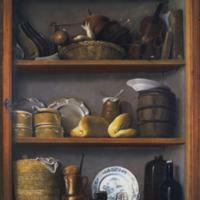 “The Painter’s Cupboard.” In Mexico: Splendors of Thirty Centuries. New York: Metropolitan Museum of Art, 435-436. Pierce, Donna and Erin Neubert. 2004. 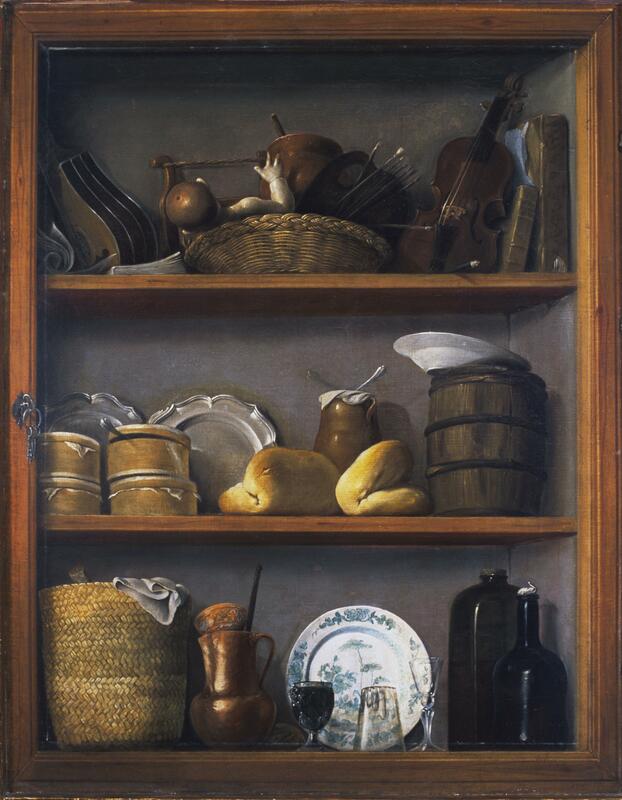 “The Painter’s Cupboard.” In Painting a New World: Mexican Art and Life, 1521-1821. Donna Pierce, Rogelio Ruiz Gomar, and Clara Bargellini, eds. Denver: Frederick and Jan Mayer Center for Pre-Columbian and Spanish Colonial Art at the Denver Art Museum, 222-225.